Officer First Class M. Donovan responded to the unit block of Highland Boulevard and made contact with two subjects who were sitting on the stairs. While speaking with the subjects, Officer Donovan noticed a strong odor of marijuana emanating from their clothing. 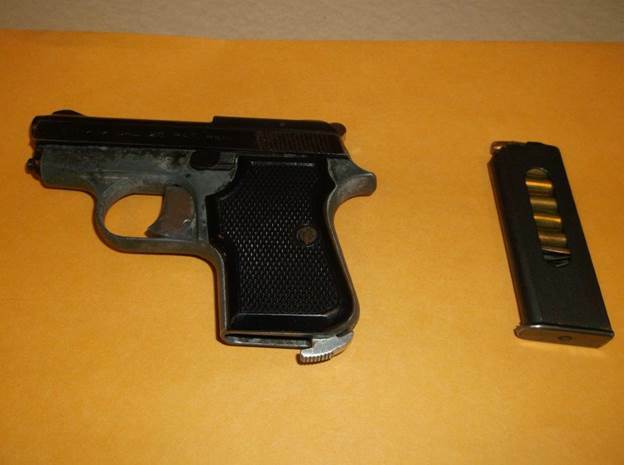 A search was conducted and Officer Donovan located a loaded small caliber handgun (pictured below), a small amount of suspected marijuana, and just over $300.00 in cash in the pocket of a 16 year old male. The money was later seized as suspected drug sales proceeds. The 16-year-old was charged with carrying a concealed deadly weapon, possession of a firearm by a person prohibited (juvenile), possession of marijuana and loitering. He was arraigned and later released on $12,200.00 unsecured bail. The New Castle County Police ask that all citizens call and report suspicious activity. Call 911 or (302) 573-2800 to report any activity that causes alarm or an inconvenience. Citizens can also visit our website at www.NCCPD.com and follow the link “Crime Tips and Alerts”. Tipsters may also call Crime Stoppers at (800) TIP-3333 or visit us on Facebook at New Castle County Police Department. Citizens who currently have the smartphone application are encouraged to use the “submit tip” tab to submit tips. Select a topic by using the “drop down” and complete the tip by “clicking” submit. The New Castle County Police Smartphone Application is free to download and available for all iPhone and Android smartphones.